Jimbocho is a historical, book-centric district in central Tokyo. Though it's best known as a haven for bibliophiles, the surrounding areas are brimming with an eclectic mix of outlets. From books and music to theater and visual arts, Jimbocho has become one of most fascinating districts in Japan's vibrant capital city. Jimbocho (神保町) is located in the northern end of central Tokyo, nestled near the illustrious Meiji University. As such, it should come as no surprise that the Jimbocho area is one of Tokyo's academic centers, and a real hotspot for those who have a thirst for learning. The district is home to one of the largest book collections in the country, with well over 150 bookshops spread along the central avenue and its adjoining backstreets. On offer are educational tomes on Japanese history, classic American superhero comics from the '70s and '80s, vintage collections of Japanese cultural art books, libraries with numerous books by English literary greats and everything in between. Jimbocho is a bookworm's paradise, and one of Tokyo's coolest areas to boot. It's said that the genesis of this area came about when local publishers decided to open up shop in order to supply books to student attending the many surrounding law schools. As the demand for books increased so did the size and variation of the supply. Before long Jimbocho transformed from a quiet district to one of the city's most popular and thriving student hangouts. Thankfully for us, Jimbocho defiantly stood the test of time, and some of these bookstores are still in operation today. In spite of the Great Kanto Fire of 1923, World War II, earthquakes or typhoons, and the progress of technology, it still remains in all its literary splendor as Tokyo's greatest district-sized library. Jimbocho is a great place to visit from January through December. However, the annual used book festival (celebrating it's 28th anniversary in 2018) is undoubtedly the best time of the year to check it out, especially if you want to nab yourself a bargain*. The stores in Jimbocho—which are already teeming with books—literally spill out onto the streets. Yasukuni-dori and the back streets that are parallel and adjacent to Jimbocho's main thoroughfare are lined with bookshelves offering titles from every genre and time period under the (rising) sun. As you may expect, the majority of the books are in Japanese. However, there are plenty of awesome collections of English novels, scholarly works, comics, magazines and art books—most of which are at a reduced price for the duration of the festival! You just need to know where to look, and that's what we're here for! *The festival typically runs over a period of about 10 days in Autumn. 2018's festival is from October 26 to November 4. For more info click here. Kitazawa Shoten is one of the main stores along Yasukuni-dori. The ground floor focuses on children's books and has a café, but the real treat is upstairs. The second floor is like a fusion between an antique bookstore and a mini museum of literature. It exudes an aura of grandeur as you walk up the Showa Period spiral staircase, the walls adorned with classical artwork. Once through the glass doors, you step into the rich archives of European literature. Most of the books in Kitazawa are for sale, from Joyce, Dickens, Austen and Bronte to Tolstoy, Dostoevsky, Homer and Hugo. There are even full sections devoted to more niche topics, like a shelf comprised of Celtic literature in renaissance Ireland, as well as a section that focuses on obscure Greek tragedies. Admittedly Kitazawa is a little pricier than most of the other bookstores in Jimbocho, but if you have an appreciation of antique books or literary history, then it's a must-visit. The place is filled with original print editions of some of the greatest books ever written, books whose covers tell nearly as much of a story as their contents. There's also a collection of "display only" books, which you are free to pick up and read at the table inside the store but are, unfortunately, not for sale. Hours of Operation: 11 a.m. to 5 p.m., Monday through Friday. 12 p.m. to 5:30 p.m. on Saturdays, closed on Sundays. At Wonder (@ワンダ) is also located along Yasukuni-dori, but is in stark contrast to Kitazawa Shoten. Much of the focus here is on magazines, with an extensive collection of English comics and Japanese manga. They have a huge assortment of trades of Spiderman, Captain America, X-Men and almost every other superhero from the vast expanse of the Marvel Universe. Of course, many DC superheroes feature just as prominently alongside classic Japanese manga comics and some obscure superheroes from Japan and beyond. A lot of the copies are original editions from as far back as the '70s and '80s, and generally they're still in near-mint condition. The comics are cheap anyway, averaging out around ¥600/700 (about US$6), but you can expect to get them considerably cheaper if you go during festival week. Better yet, just in case you can't wait to tear your newly purchased vintage comics out of their plastic sleeves, At Wonder also has a café upstairs where you can immediately dive in over a fresh cup of coffee. Hours of Operation: 11 a.m. to 7 p.m. Monday to Saturday. Closes at 6 p.m. on Sundays. Oshima Shoten was founded in 1945 in the wake of World War II, and specializes in foreign books in English, German and French. The prices in Oshima Shoten are super cheap, especially given that many of the books are quite obscure. If you happen to stumble upon a hidden gem, you're almost guaranteed a great deal. 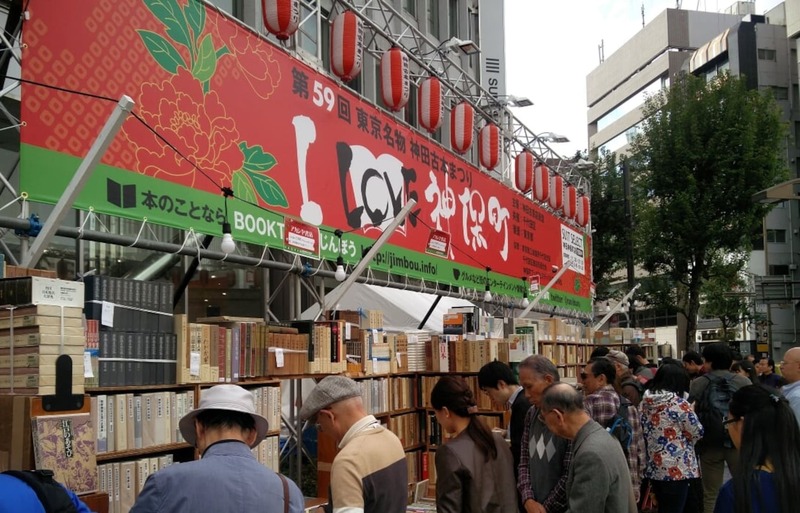 During the festival, many of these books are sold at a 50 percent discount, meaning you can get them for as little as ¥100! 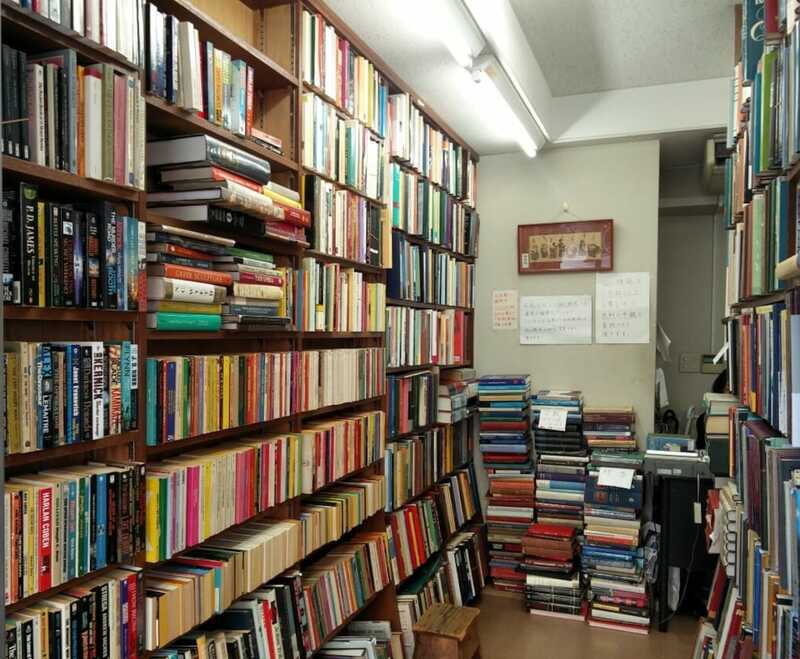 On top of the three aforementioned stores there are also many others that have selections of English books in various sizes—Sanseido, which is next door to Oshima, is also quite popular among English-speaking visitors. But one of Jimbocho's great joys is in navigating the backstreets and aisles of shelves in the myriad stores to see what you can find for yourself! Hours of Operation: 10:30 a.m. to 6:30 p.m. Monday through Saturday. Closed Sundays. While the written word undoubtedly takes the center stage in Jimbocho, that doesn't mean that it's lacking when it comes to other artistic pursuits. Nestled in between the many bookstores you can find some wonderful, stylistic art collections. There's also an art gallery and a local theater in the area, and the roads between Jimbocho and Ochanomizu to the north are littered with music shops. Some of the stores in Jimbocho sell vintage and local artwork. If you're in Jimbocho during the week of the festival, the stores that specialize in art will be easier to spot, since it's on display throughout the area. It's also when you're most likely to get more of bang for your buck. However, the biggest draw of all for art enthusiasts is probably the Mita Arts Gallery, where they specialize in ukiyo-e (浮世絵), artistic woodblock prints that often depict Japanese customs, traditions and history. The Mita Arts Gallery has been dealing in ukiyo-e since the '60s, and in 50-plus years they have amassed a vast collection. One of the great things about the gallery is that you can purchase almost anything they have in stock. Some ukiyo-e prints will be the price of a good souvenir, where as some museum-quality prints are pricey enough you might have to file bankruptcy! Hours of Operation: 10:30 a.m. to 6 p.m. Tuesday through Saturday. Closed Sundays, Mondays and National Holidays. The Jimbocho Theater is a performing arts complex that is comprised of a cinema, a "story-telling" auditorium and a rehearsal room. In keeping with the artistic vibe of the neighborhood, Jimbocho theater is instantly recognizable by its black, fractured façade, an iconic look that resembles something you might find inside the Death Star! Fortunately, what goes on inside is considerably less menacing. Variety is the flavor of the month every month, at the Jimbocho Theater. They do traditional kabuki, modern classics, brash comedies and saccharine tales of romance. Most of the performances are in Japanese, but viewing a foreign play is undoubtedly one of the best ways to get a unique insight into a different culture! The Meiji University theater group also puts on live events, including the upcoming 'Shakespeare Project' with five performances of The Merchant of Venice from November 9 to 11. Hours of Operation: Showtimes and prices vary by performance. Between Jimbocho and Ochanomizu Station is arguably Tokyo's largest collection of music shops, with nearly 50 individual stores across a 70 hectare area. There are shops selling all sorts of instruments, so whether you are a violin virtuoso or picking up your first drum kit, there'll be something here to whet your appetite. Again the demands of Meiji University students are responsible for the rapid proliferation of specialist stores in the area. The nearby Tokyo College of Music was the first private music academy to be established in the country back in 1907. The musical influences of the early 20th century have never faded in Jimbocho and Ochanomizu, with a dense population of music academies still situated in the surrounding districts. With so much to choose from, the recommended route would be to take a stroll down 1 Chome Kanda Surugadai from Ochanomizu Station towards Jimbocho, and see what draws your eye! Sabouru and Sabouru 2: Sabouru (pictured above) has the rustic wooden interior of an old gas-lit lodge and serves top-notch coffee. Saboru 2 shifts the focus toward food and has become a popular eatery that specializes in foreign cuisine. Maruka Udon: This one is easy to spot given the consistently large queues pouring out from its noren-covered doorway. But, if you don't mind the 45-minute wait, you're in for a treat. Maruka's speciality is in Shikoku-style udon noodles, and it is easily one of the best restaurants within walking distance from Jimbocho.